What are the possibilities for Humboldt County? The Humboldt Development Authority and its Winnemucca Futures Project is hosting the 4th Winnemucca Futures Forum 9:00 AM to 4:00 PM, on Thursday, September 1, at the Convention Center in Winnemucca. Newmont Mining – Status of operations, needs, and challenges in Nevada, northern Nevada and in our region. Brief updates on the Carlin Trend, Twin Creeks, Phoenix, Long Canyon, etc. Barrick Gold – Status of operations, needs, and challenges in Nevada, especially northern Nevada. Brief updates on the Carlin Trend, Gold Strike, Cortez, Turquoise Ridge, etc. Rye Patch Gold – Update on the re-opening of Florida Canyon and progress on other projects. Klondex Mines – Updates on the Midas and Fire Creek Mines. Silver Standard Resources – Update on their activities and plans for the Marigold Mine. Winnemucca Boys and Girls Club – Progress on the construction and update on operation plans. ICON International Foundation – An introduction to the plans for the Nevada Institute of Science and their plans to build a large scale aquaponics facility, along with an education and training project in Humboldt County. Humboldt General Hospital – Updates on expansion projects and future plans. Governor’s Office of Economic Development – Plans and projects to increase economic opportunities for rural Nevada. Great Basin College – How this important cornerstone of our community is moving ahead to provide training and education to citizens and provide businesses with their needed talent. Humboldt Development Authority’s Board Chairman Pat Gray says that “a lot has changed since our 2014 forum. At that time we had just experienced a huge downturn in the price of gold and many operations and the community were trying to figure out how to deal with it. Now prices seem to have stabilized and local operations have made most of the adjustments necessary to get back into the black”. 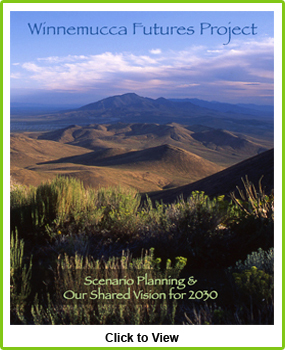 The Winnemucca Futures Project is designed to proactively promote the public interest by encouraging community growth and sustainable development through communications and collaboration. Its Futures Forum’s are designed to inform and educate local leaders, decision makers, and citizens about the many changes sweeping rapidly over the world, and affecting local communities in the region. Previous Winnemucca Futures Project workshops, discussions, and forums have focused on global trends like population dynamics, world food supplies, and changing economic circumstances across the globe. Conversations have explored and discussed the major economic drivers impacting the local future, including information technologies, agricultural crop prices, and water supplies. Local community capacity issues like leadership development, collaboration and communications have been addressed. Community members have been probing and thinking deeply about how all these issues will affect their ability to create a responsive and adaptable community that can reach its agreed upon vision. For planning purposes, organizers urge you to confirm your attendance at the Forum. Please contact HDA Coordinator Bill Sims at (775) 623-1064, or email bills@unr.edu. If you have any questions or concerns, please contact Bill or any of the Humboldt Development Authority Board of Directors. The Humboldt Development Authority is the economic development agency partnership of public and private entities and individuals formed by a cooperative agreement between the City of Winnemucca and the Humboldt County Commission. The Winnemucca Futures Project is designed to proactively promote the public interest by encouraging community growth and sustainable development through communications and collaboration. The Winnemucca Futures Project is designed to be an open and fair process. We are dedicated to hearing all voices. Debra Deming on Humboldt County 2030 ! © 2019 The Winnemucca Futures Project · Proudly powered by WordPress & Green Park 2 by Cordobo.